McKay Timber is a major manufacturer and supplier of timber and roof trusses to the Tasmanian building and joinery market, and the equal largest native hardwood processing company in Tasmania. With a history dating back over 60 years, they have built an unrivalled reputation in the industry for supplying high quality timber products. “We believe our product is of the highest quality product in the state and we believe that Tasmanian native hardwood is one of the best quality products available,” says Brett McKay, the company’s General Manager. 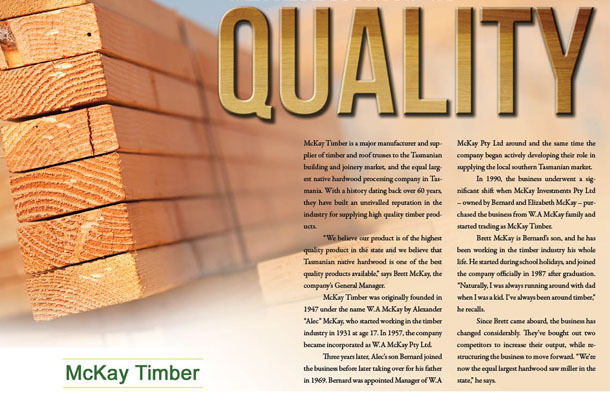 McKay Timber was originally founded in 1947 under the name W.A McKay by Alexander “Alec” McKay, who started working in the timber industry in 1931 at age 17. In 1957, the company became incorporated as W.A McKay Pty Ltd.
Three years later, Alec’s son Bernard joined the business before later taking over for his father in 1969. Bernard was appointed Manager of W.A McKay Pty Ltd around and the same time the company began actively developing their role in supplying the local southern Tasmanian market. 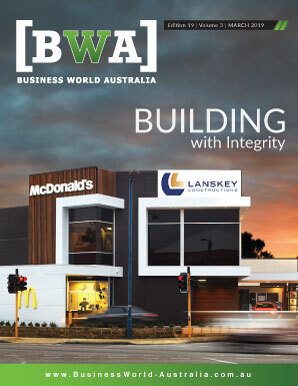 In 1990, the business underwent a significant shift when McKay Investments Pty Ltd – owned by Bernard and Elizabeth McKay – purchased the business from W.A McKay family and started trading as McKay Timber. Brett McKay is Bernard’s son, and he has been working in the timber industry his whole life. He started during school holidays, and joined the company officially in 1987 after graduation. “Naturally, I was always running around with dad when I was a kid. I’ve always been around timber,” he recalls. Since Brett came aboard, the business has changed considerably. They’ve bought out two competitors to increase their output, while restructuring the business to move forward. “We’re now the equal largest hardwood saw miller in the state,” he says. As a 100 per cent Tasmanian and family-owned and operated business, McKay Timber has been an industry mainstay going back generations. That longevity, Brett says, is one of the main things that set them apart from other timber suppliers. In their many years of business, they have earned a lot of experience and gained an outstanding reputation for supplying high quality timber products and service. They take great pride in maintaining and growing that reputation. McKay Timber also stands apart due to the quality of their offering – a quality they have achieved through experience, and through internal investment. Over the last 10 years, Brett says they have invested approximately $9 million back into the business for production expansion, which has included modernising two of their saw mills. One of the mills is now mostly automated, and gives them “very good sizing,” Brett says, enabling them to increase their recoveries from the logs to get the best out of them. 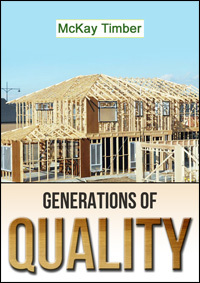 The calibre of McKay Timber’s staff has also been essential to maintaining their reputation. As a family-owned business, they employ 92 people – some of whom are second-generation employees, or have been with the company for 30 or more years. Brett says the company has an open-door policy and a family-type atmosphere when it comes to their employees. At McKay Timber, special consideration and care is given to how their product is made as it relates to the environment. Their chain of custody ensures that the timber is only supplied from legally-harvested forests, which are also sustainably managed. “We buy certified product from our suppliers and we’re encouraging people that we supply to get chain of custody to certify their product,” Brett says. McKay Timber is also setting up a pilot plant with Pellet Fires Tasmania to make wood pellets for domestic heaters out of their shavings residue from their dry mill. They also sell their dry shavings and sawdust from their saw mills for bio-energy, which goes into furnaces to heat industrial-sized hot houses for tomato growing, brick kilns and other uses. “We’re always looking at the best way we can use 100 per cent of the resource that comes our way in log form,” says Brett. Late last year, the Tasmanian Forestry Agreement was passed by the Lower House. If this act becomes law, McKay Timber will comply with it, to ensure the best outcome for their business and for Tasmania. Moving forward, Brett says they will continue to pursue those optimal outcomes, which his family and his company are known for doing. The longer term future of McKay Timber will include more diversification in their daily operations. This includes the purchase of new-line building products as soon as they become available, so they can continue providing their customers with the highest quality timber using the most modern equipment.